Andrew and Rachel Wilson are part of the leadership team at Kings Church in Eastbourne in the United Kingdom, and have two children, Zeke and Anna. Andrew is also a columnist for Christianity Today and the author of a number of books, including If God, Then What? and Unbreakable. Cassandra's Review- I personally have children with special needs and never thought of it as a challenge or different than raising any other "normal" child. You just have to be a stronger parent and take the time to learn the disability and how to work with it. I find it in poor taste to write a book focusing on how hard and trying it is to be a parent. Focusing any time on yourself and having a pity party. 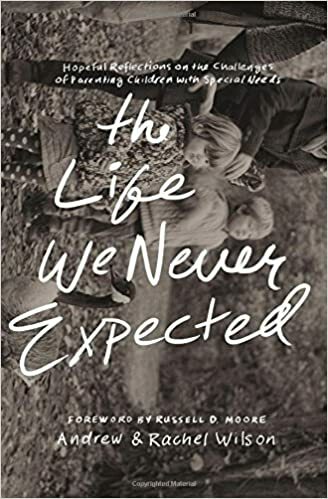 However if you should be one of those people who feel the need to connect and feel poorly about your life and children as well as weep and be dismayed, this book will go well with you and help to join you with the authors who feel the same way. God and faith are added in to give strength, but I found the whole book to be in poor taste. For anyone to write about the trials of having kids and then add in that they are special needs is to me insulting. All children are tough to raise and the authors had a choice to give them up for adoption if they could not handle having the added "stress" I just feel like they are giving up and saying that God is going to handle everything instead of taking charge and asking God to lift them up. Maybe I read the book wrong, but that is how I personally felt. I will not give these authors a pat on the back for having a life most people do and being lucky enough to be blessed with any children to begin with. They seem to have spent most of their life looking down and backward. Yet wrote the book to help others look up. "Disclosure (in accordance with the FTC’s 16 CFR, Part 255: “Guides Concerning the Use of Endorsements and Testimonials in Advertising”): Many thanks to Propeller Consulting, LLC for providing this prize for the giveaway. Choice of winners and opinions are 100% my own and NOT influenced by monetary compensation.